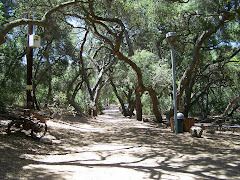 This is one of the places I used to frequent when I started birding in Orange County back in the 1980's. We called it Newport Back Bay. The notations in my old birding field guide say "NBB." This is a wonderful place to bird watch with habitats such as open water, mudflat, saltmarsh, freshwater marsh/pond, riparian, and upland (bluffs, cliffs, and mesas). (See the Upper Newport Bay page on its habitats for more information.) The Back Bay road is often closed if it is raining or has rained recently. This is because area streams and nearby community run off flow through the Newport Back Bay on its way to the ocean. When it rains the water starts flowing in quickly, and things can get a bit wet. Newport Back Bay as a storm rolled in. I got in the car and on the road just in time to avoid a major soaking. Note: Lots of rain will cause the closure of Back Bay Drive. 1) The most common entrance is from Jamboree. You go south on Jamboree to San Joaquin Hills Road and turn right. Go all the way until it dead ends at Back Bay Drive. You can park on the side of the road on San Joaquin Hills Road. You will be on the East side of the reserve entering in the lower side of Back Bay Drive. You can walk either to the left or the right on Back Bay Drive. One of a pair of Osprey that nest at Newport Back Bay. I like to walk left on Back Bay Drive toward the Science Center on Shellmaker and get a look at the Osprey who are usually down at that end. You can also see Kingfishers on the signs across the marsh by the marina. Also common on that end are Red-Tailed Hawks, Northern Harriers , Common Yellowthroats , Brown Pelicans (in fall and winter), Turkey Vultures soaring overhead, Great Blue Herons , Great Egrets, Snowy Egrets, Black Skimmers , American Avocets, Black Phoebes, and much more. (Note that the Science Center is not open to the public except by appointment. You cannot just walk in.) Then I get back in my car, turn right on Back Bay Drive and drive to the midway parking lot which is on the left of Back Bay Drive midway between San Joaquin Hills Road and East Bluff Drive. Then I bird watch a little, get back in the car, and drive to the top of Back Bay. I turn left on Eastbluff Drive and left on Jamboree. Black Skimmers often sit on the shore just past the midway parking lot. That's an American Avocet front middle (black and white) and a Willet (gray) far right and and a Marbled Godwit (patterned brown) to the left of the Avocet in front of the Black Skimmers. Common sight: Turkey Vulture soaring overhead on clean up patrol. The happy Osprey couple. This is the second year of nesting at the Back Bay. A Red-Tailed Hawk surveying the area near the Muth Interpretive Center off Irvine Avenue. 4) Some people like to walk on the less traveled side of the Back Bay. The good thing about this side is that it is a bit less crowded. There are streams and marsh and riparian habitat and lots of variety on this side. This is--in general-- the drier side of the Newport Back Bay. 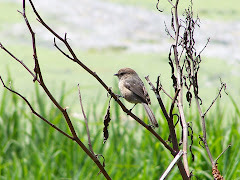 You will see Common Yellowthroats, White-crowned Sparrows, Black Phoebes, Red-Tailed Hawks that you can get a really good look at, Turkey Vultures, American Kestrels, Northern Harriers, Hummingbirds of several kinds, ducks of several kinds, American Coots, grebes, and more. More land birds, but less water birds--especially less shore birds, herons, and egrets. Traveling south on the 55 Freeway, exit on Fair and Del Mar (same exit as Vanguard University). You will drive a short distance to get to Del Mar after you exit the freeway. Turn left on Del Mar and drive for almost a mile. Cross Irvine Avenue. Newport Ecological Preserve is on your right. Look for the parking lot. Stop at the Muth Interpretive Center and get a trail map. Take a little time to look at the great exhibits. Wintering and resident waterfowl congregating in a water channel in the marsh by Back Bay Dr. Mallard in front, Northern Pintails , an American Coot , and back left are two Green-winged Teals, and in the very back is a Lesser Scaup. Newport Ecological Reserve is the Upper Newport Bay and the surrounding wetlands and related areas. (A more detailed explanation of the complex Newport Back Bay is below.) Upper Newport Bay includes many types of environments. When you walk on the east side of the Reserve, you will see mostly wetlands and large water areas of estuary. The west side has little streams through the wetlands, and distant views of the estuary section of the Back bay, but mostly riparian and mesa habitats. So what is an estuary you might ask. Well, it is a place where fresh and salt water mix. The Upper Newport Bay combines the fresh water from streams, channels, and other runoff with the ocean currents to produce a nutritious estuary environment for all kinds of wildlife. Osprey with a fish. It ate for a long time--it was a big fish. You can must see a bit of the tail to the right of the pole. This Newport Beach estuary is a rich place for all kinds of wildlife from microscopic animals to fish, to osprey, to herons, egrets, ducks, rails, warblers, shorebirds of all kinds, Pelicans, hawks, falcons, coyotes, and a bobcat or two. You never know what you might find here. It is a great place for resident species, for migrants needing a place to stay, and for wintering waterfowl and shorebirds. The Upper Newport Bay is surrounded by marsh, water channels, riparian habitat, and mesa. 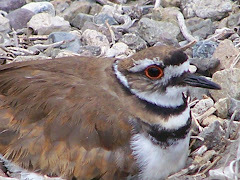 The variety of habitat draws a variety of wildlife to the reserve. According to the Upper Newport Bay Ecological Reserve website, on any winter day, up to 30,000 birds may be seen at Upper Newport Bay. That's a lot of birds. Lesser Scaups wintering at the Back Bay. Headed in for a drink and a bath. The Newport Back Bay is actually two wildlife areas in one. First there is the Upper Newport Bay Ecological Reserve which is the main estuary and surrounding marsh and is managed by the California Department of Fish and Game. Later came the Upper Newport Bay Nature Preserve consisting of 140 acres of bluffs and other land surrounding on the north and northwest side of the original UNB Ecological Reserve. This additional acquisition was county land dedicated as an Orange County Regional Park called Upper Newport Bay Nature Preserve. The county's Upper Newport Bay Nature Preserve (140 acres) and the original state Upper Newport Bay Ecological Reserve (752 acres) together total 892 acres. In a testimony to cooperation, the City of Newport Beach also assists in preserving and maintaining the Back Bay. Anna's Hummingbird scanning the area above the Muth Center. The Upper Newport Bay has many kinds of birds including several kinds of Hummingbirds. This Anna's, shown above was spotted outside the Muth Center. This side of the Preserve has many flowers, and lots of places for hummers to sit and survey the area. Common Yellowthroat in the habitat near the path down to the Muth Interpretive Center. Over 90 bird species are listed as common in the Upper Newport Bay with even more that are not common. Common birds include grebes, pelicans, cormorants, herons, egrets, ducks, vultures, hawks, falcons, rails and coots, plovers, stilts and avocets, sandpipers, gulls and terns, Black Skimmers, pigeons and doves, hummingbirds, owls, swifts, flycatchers, swallows, crows and ravens, bushtits, wrens, kinglets, gnatcatchers, mockingbirds, pipits, shrikes, starlings, warblers, sparrows, blackbirds, and finches. The Upper Newport Bay is one of the premier birding hotspots of Orange County. It is a wonderful place to bird watch. Birders flock here to see birds year round. Check out Sea and Sage Audubon's Monthly Census of Birds at the Upper Newport Bay for more details . Allen's Hummingbird watching his territory. On the trail from Muth Interpretive Center up toward Jamboree. 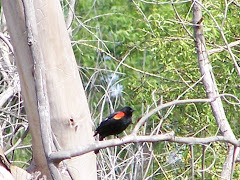 This hummer is not listed as a common bird, yet it can be seen at Newport Back Bay. In addition to birds, the Upper Newport Bay is home to at least one Bobcat, several Coyotes, and lots of smaller mammals as well. They have named one Bobcat "Babe." She had babies last year, so you know there are more around than just "Babe." It is illegal to release domestic animals such as turtles or other pets in this wildlife reserve. Domestic animals can endanger the plants, animals, and fish at the Back Bay. Although dogs are allowed on-leash on many trails, they cannot be off-leash at all in the Back Bay. Letting your dog off-leash in the Back Bay can result in hefty fines. In addition, be alert because there are trails that forbid dogs on-leash or off-leash at the Back Bay. A channel winding through the wetlands. The Upper Newport Bay has two educational centers. The Muth Interpretive Center at Upper Newport Bay and the Back Bay Science Center (by appointment only). The Muth Interpretive Center is awesome. It has many displays and lots of multimedia exhibits. The docents are very helpful. Check out my post on the Muth Center for more details. The Science Center is very hands on and very student oriented. The Science Center also tests the water quality in its lab. It is dedicated to research and education. It has scientific displays and activities. Again, the Science Center is only open by appointment. You cannot walk in. Great Egret fishing in a channel among the grasses. This is a wonderful place to go birding. 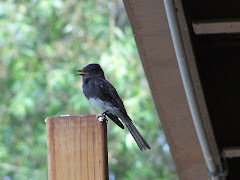 There are many habitats and a variety of birds to see in this beautiful place. In addition to birding, many people go walking, jogging, cycling, and skating at the Upper Newport Bay. There are paved roads on both sides of the Upper Bay where these activities are common. The bikes can get pretty fast so stay alert especially on Back Bay. All of us who enjoy the Upper Newport Bay in Newport Beach, California owe a heartfelt thank you to Frances and Frank Robinson and the other citizens of Orange County who fought long and hard to preserve the Newport Back Bay for their generation and the generations to follow. Without those who fought the entities that wanted to develop the Back Bay into another cookie-cutter commercial marina, we would not have this natural treasure today. So when you are at the Back Bay and see Great Blue Herons, the Great Egrets, the Black Skimmers, Red-Tailed Hawks, Northern Harriers, Brown Pelicans, and the other 200 species that come through this estuary and the surrounding tidal wetlands and bluffs each year, say a silent thank you to those who made sure that we could stand here today. Thank you from all of us. The wetlands at low tide. A great time for shorebirds to get squiggly goodies out of the mud. 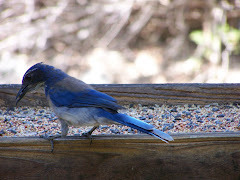 There are many birds to see at various times of year at the Upper Newport Bay. It is a major stop over for migrants and a wintering spot for many herons, egrets, grebes, mergansers, ducks, and many more water birds. See below for a video showing different birds at the Upper Newport Bay. Check out the map below to see how you can get to the Upper Newport Bay for an awesome day of birding in Orange County. Official home of Upper Newport Bay. Website of many organizations about Upper Newport Bay. County of Orange site about the Upper Newport Bay Ecological Preserve and the Upper Newport Bay Ecological Preserve. The Interpretive Center at Newport Back Bay. It is a not-to-be-missed educational multimedia experience about the Back Bay. The Back Bay Science Center is a wonderful science experience for children. You may visit by appointment only. Many schools have field trips to the center. See what the latest stats are for birds at the Newport Back Bay. Click on the picture above to go straight to Amazon.com and check out the cameras and other great birding equipment.